After releasing extremely successful album “Evolve” in June of last year, Imagine Dragons has made a quick comeback by releasing their newest album, “Origins,” Friday. “Evolve” singles “Believer” and “Thunder” both peaked at No. 4 on the Billboard Hot 100, and “Whatever It Takes” peaked at No. 12. It could have been a risky move to have such quick turnaround, as the next project could pale in comparison to the previous album. However, Imagine Dragons had no problem delivering a quality album that was much different from their previous album, “Evolve,” as 15-track “Origins” shows no signs of a decline in quality. Full of experimental electronic sounds and dreamy synth patterns, “Origins” is like the calmer, quirkier, more eclectic sibling of “Evolve” and shows off lead singer Dan Reynolds’ songwriting skills as he stays honest about his personal life and his struggles. Reynolds has been open about his struggles with his mental health throughout his career, and this album feels like Reynolds opening up to his fans and telling his story of truth to the world. “Bad Liar” is one of the most vulnerable tracks that Imagine Dragons has put out so far. Reynolds starts the song by singing, “Oh, hush, my dear, it’s been a difficult year.” In April, he announced that he and his wife of seven years would be getting a divorce. This song was co-written with his wife, Aja Volkman, before they decided to take some time away from each other, so they both knew the troubles that they were facing in their relationship. 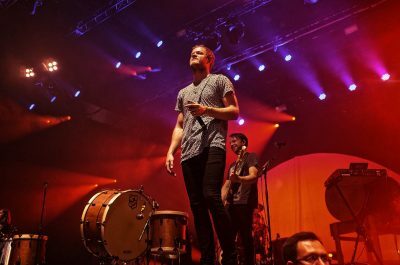 “Cool Out” is a mellow track where Imagine Dragons deviates from their normal, powerful rock sounds and show off a softer side of Reynolds’ vocals. Bright synths in the chorus made this song stand out from any other previous songs that the band has released — it provides the listener with a dreamy vibe rather than the gritty rock vocals a listener would normally expect from an Imagine Dragons song. “Zero,” a song that is part of the soundtrack of new movie “Ralph Breaks the Internet,” is a fast-tempo song that is definitely much more pop than any of the other songs on the album. The vocal range stays pretty low and mellow throughout the song and actually sounded like a song that OneRepublic or The Script could sing, further showing off the diversity that Imagine Dragons was able to pull off with this album. The track starts out mellow with chill instrumentals for a slow start, but it changes up a little bit when Reynolds belts out the high notes in the chorus in his signature gritty voice. The chorus is undeniably catchy and is something that only Reynolds and the rest of Imagine Dragons could pull off. With this new album, Imagine Dragons is taking a step in the right direction by showing that they are more than just a rock band that sings anthems fit for an arena setting. The diversity of music on this album should make fans excited about what is to come for Imagine Dragons in the future.